When discussing video communication and digital broadband networks, it is impossible not to mention Aethra. 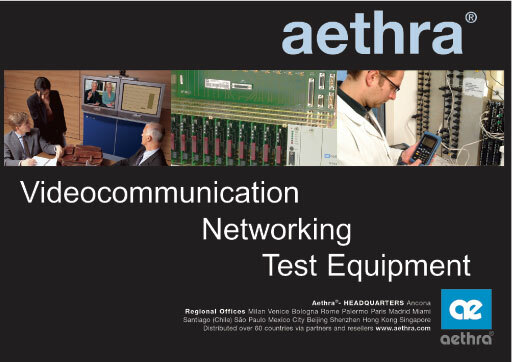 Aethra is a leader in the global telecommunications market, distributing its leading-edge products worldwide. Thirty years of experience in the telecommunications media domain has positioned Aethra as the European leader for video communication solutions and network terminations. Aethra has been one of the pioneers in broadband solutions; it was, and is, the main ISDN CPE provider for more than 40 carriers, and today Aethra is shipping thousands of ADSL and SHDSL carrier solutions to its customers. Innovation has always been the main focus of Aethra’s strategy and new technology is the cornerstone of the company’s success. The mission of the company is to continue its leadership in professional audio and video communications over broadband networks, and to achieve broadband network convergence thanks to experience gained in the networking, video communication and services sectors: this is the company’s view. The dynamic Research & Development (R&D) department is at the heart of the company’s business philosophy. This enables Aethra to stay at the cutting-edge of technological developments and - as a central aspect of Aethra’s business strategy - to assist and support its customers directly. Uncompromising quality is fundamental for Aethra, a company committed to rigorous quality control of equipment and manufacturing processes, which guarantees first-class performance of all its products. As a result, the company produces high quality products compliant with key international standards, and creates highly flexible, personalized solutions for its customers. Every year, the company invests significant revenue back into R&D and participates in numerous European and international research projects, with the aim of achieving increasing levels of customer satisfaction. This not only enables Aethra to react responsively to business needs, but also enables anticipation of customers’ forthcoming business requirements. Consequently, Aethra has the ability to foresee the need for more effective and efficient communication tools in the business world, and to provide new and innovative solutions in a timely manner. This reflects Aethra’s business philosophy, strategies and customer approach. ISDN, ADSL and SHDSL products: network terminations, modems, routers and frame relay terminations. Test equipment for telecommunications networks. Aethra’s network termination product line has been designed according the requirements of the carriers, aiming to address residential, small/home office and business markets. This has lead to develop very efficient multi-mode operation devices, fully interoperable with the major central office equipment vendor, including bridging and basic routing capabilities for broadband access to the Internet and to a corporate LAN, these products represent the most flexible solutions for the Internet Service Provider community. In particular, Aethra’s experience has been concentrated to design highly flexible SHDSL terminations that support ATM Circuit Emulation Service (CES) and Frame Relay to ATM Interworking functionalities common to all the multiservice AC and AF network terminations models. These solutions enable telcos to connect users’ PABX, frame relay routers, and TDM multiplexers over their ATM backbone using inexpensive DSLAMs ports or to gather their legacy traffic, without needing to upgrade the entire network. Bonding technologies allow the transport of up to 10 Mbit over 4 copper pairs, suitable for providing long-reach broadband, transport legacy services or providing ATM-like services. Most of the solutions present in Aethra’s portfolio have been developed following telcos’ carrier requests, therefore this positive experience could be shared with other carriers facing similar problems. The Aethra family includes Integrated Access Devices (IADs) supporting ADSL and SHDSL line transmission technologies to provide small and medium businesses with integrated broadband data and carrier-class voice services over a copper pair. A unique feature of the Aethra IADs is the simultaneous support for POTS and BRI ports in the same box. Based on Aethra’s long-term worldwide experience in intelligent ISDN terminations for voice networks, each of these devices guarantees seamless installation thanks to the highest degree of compatibility with all types and brands of legacy telephony devices, including fax machines, phone sets, etc. Aethra is a leader in the global video communication market, offering a wide range of state-of-the-art solutions including: desktops, videophones, codecs, set-tops, rollabouts and systems created specifically for vertical sectors like telemedicine, distance learning, remote banking, video-surveillance and telefashion. Multi-audio-conference, multi-videoconference and video-streaming are provided through Aethra.net, the Aethra Group company dedicated to such services. The network and video experience make Aethra the best Tripleplay partner available today on the market. The Research & Development department plays a significant role in the development of innovative products. In particular a team from the R&D department attends meetings held by the main international standardization bodies: ITU, IEEE802, ETSI, IMT, IETF, ISO, ATM Forum and DSL Forum. This provides Aethra with the latest information about new trends and innovations. Aethra’s unique and winning strategy is, and will continue to be the close collaboration with its telecom clients. By collecting exhaustive data regarding client requirements, Aethra is able to propose new projects and products, and to guarantee problem solving, technical assistance, and interoperability worldwide. A number of Aethra products have been developed thanks to collaboration with ILEC and CLEC operators and were designed to meet their specific requirements. The team of staff at Aethra concentrated its efforts on meeting all the Telecom Operators’ requirements and solving their particular network needs by proposing the best solutions. Aethra was founded in December 1972 by Giulio Viezzoli, President and CEO of Aethra, with the aim of becoming an international market leader in the telecommunications industry. Aethra has been utilizing digital technology since the 1970s, and the company first developed ISDN products, terminations and videoconferencing systems, in the 1980s. Over the past decade, Aethra has focused on the development of a wide range of video communication solutions, satisfying the requirements of many different sectors. Aethra was one of the first companies in the world to design and create video communication systems. Aethra was also the first company to provide the market with more sophisticated solutions for specific applications, including telemedicine and video surveillance. In the networking sector, Aethra boasts long and fruitful experience, enriched over time by many working relationships with international telecom carriers, over 40 of which are now Aethra customers. In the network sector, Aethra has the ability to understand the requirements of telecommunications management by providing reliable solutions. Today, with headquarters in Ancona, Italy and offices around the world, Aethra is one of the key players in the global telecommunications market, with a presence in over 60 countries.